This article is about the book. For the concept, see Antifragility. Antifragile: Things That Gain From Disorder is a book by Nassim Nicholas Taleb published on November 27, 2012, by Random House in the United States and Penguin in the United Kingdom. This book builds upon ideas from his previous works including Fooled by Randomness (2001), The Black Swan (2007–2010), and The Bed of Procrustes (2010–2016) and is the fourth book in the five-volume philosophical treatise on uncertainty titled Incerto. Some of the ideas are expanded in Taleb’s fifth book Skin in the Game: Hidden Asymmetries in Daily Life (2018). Taleb introduces the book as follows: "Some things benefit from shocks; they thrive and grow when exposed to volatility, randomness, disorder, and stressors and love adventure, risk, and uncertainty. Yet, in spite of the ubiquity of the phenomenon, there is no word for the exact opposite of fragile. According to Taleb, the opposite of fragile is antifragile. Antifragility is beyond resilience or robustness. The resilient resists shocks and stays the same; the antifragile gets better". The phenomenon is well studied in medicine, where for example Wolff's law describes how bones grow stronger due to external load. Hormesis is an example of mild antifragility, where the stressor is a poisonous substance and the antifragile becomes better overall from a small dose of the stressor. This is different from robustness or resilience in that the antifragile system improves with, not withstands, stressors, where the stressors are neither too large or small. The larger point, according to Taleb, is that depriving systems of vital stressors is not necessarily a good thing and can be downright harmful. More technically, Taleb defines antifragility as a nonlinear response: "Simply, antifragility is defined as a convex response to a stressor or source of harm (for some range of variation), leading to a positive sensitivity to increase in volatility (or variability, stress, dispersion of outcomes, or uncertainty, what is grouped under the designation "disorder cluster"). Likewise fragility is defined as a concave sensitivity to stressors, leading a negative sensitivity to increase in volatility. The relation between fragility, convexity and sensitivity to disorder is mathematical, obtained by theorem, not derived from empirical data mining or some historical narrative. It is a priori". 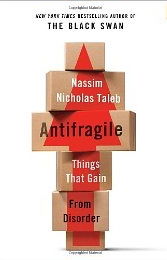 As the book progresses, Taleb covers in great depth the domain of the fragile and the opposing domain of the antifragile showing how fragility can be detected, measured, and transformed. Recurring themes throughout the book include Skin in the Game, Via Negativa, Lindy Effect, Barbell Strategy and the Green Lumber Fallacy. The concept of antifragility has been applied in physics, risk analysis, molecular biology, transportation planning, engineering, Aerospace (NASA), megaproject management, and computer science. In computer science, there is a structured proposal for an "Antifragile Software Manifesto", to react to traditional system designs. The major idea is to develop antifragility by design, building a system which improves from environment's input. Taleb’s next book Skin in the Game: Hidden Asymmetries in Daily Life furthers the idea, asserting it is necessary for fairness, commercial efficiency, and risk management, as well as being necessary to understand the world. Via negativa is a type of theological thinking that attempts to describe God by negation or in other words, by what God is not. Taleb expanded this definition to include more generally the focus on what something is not, in action, what to avoid or what not to do. Avoiding the doctor for minor illnesses or removing certain food from one’s diet to improve health are examples. In finance, a Barbell strategy is formed when a Trader invests in Long and Short duration bonds, but does not invest in Intermediate duration bonds. This strategy is useful when interest rates are rising; as the short term maturities are rolled over they receive a higher interest rate, raising the value. Taleb generalizes the phenomenon and applies it to other domains. Essentially it is the transformation of anything from fragile to antifragile. The Green Lumber Fallacy refers to a kind of fallacy where one mistakes one important kind of knowledge for another; in other words, "mistaking the source of important or even necessary knowledge, for another less visible from the outside, less tractable one... how many things we call 'relevant knowledge' aren’t so much so".:430. The root of the fallacy is that although people may be focusing on the right things, due to complexity of the thing, they are not good enough to figure it out intellectually. The term green lumber refers to a story by authors Jim Paul and Brendan Moynihan in their book What I Learned Losing A Million Dollars, where a trader made a fortune trading lumber he thought was literally "green" rather than fresh cut. "This gets at the idea that a supposed understanding of an investment rationale, a narrative or a theoretical model is unhelpful in practical trading." Toward the end of the book Taleb provides examples of the problems of agency and cherry-picking, calling them the Robert Rubin problem, the Joseph Stiglitz problem, and the Alan Blinder problem. In the last chapter (p. 412), for example, Taleb criticizes Alan Blinder, the former vice chairman of the board of governors of the Federal Reserve System for trying to sell him an investment product at Davos in 2008 which would allow an investor to circumvent the regulations limiting deposit insurance and to benefit from coverage for near unlimited amounts. Taleb commented that the scheme "would allow the super-rich to scam taxpayers by getting free government-sponsored insurance". He also criticized Blinder for using ex-regulators to game the system which they built in the first place and for voicing his opposition to policies of bank insurance that would hurt his business, i.e., claiming that what is good for his business is "for the public good". The event has been discussed in the media, but not denied by Blinder. Antifragile was a New York Times Bestseller and praised by critics in a litany of notable periodicals including the Harvard Business Review, Fortune magazine, the New Statesman, and The Economist, and Forbes. Although Boyd Tonkin of The Independent criticized Taleb’s style as "vulgar, silly, slapdash and infuriating", of the ideas in the book he remarked "time and again I returned to two questions about his core ideas: Is he right, and does it matter? My verdict? Yes, and yes." Michael Shermer gave the book a generally favorable review but Taleb responded in Nature magazine that "Michael Shermer mischaracterizes the concept of ‘antifragility’... The relation of fragility, convexity and sensitivity to disorder is thus mathematical and not derived from empirical data." Less favorable reviews include Michiko Kakutani of The New York Times, who described the book as being "maddening, bold, repetitious, judgmental, intemperate, erudite, reductive, shrewd, self-indulgent, self-congratulatory, provocative, pompous, penetrating, perspicacious and pretentious." Taleb responded in turn by noting one of five errors from her review and questioning "Is she crazy enough to engage a technical subject without asking for specialist advice, or even engaging in something as basic as Google search?" Some of the negative reviews focus on Taleb's style and the overall structure of the book, particularly the difficulty to easily summarize on a cursory review. So although the book has a table of contents, chapter summaries and map, a summary of the book is difficult to discern as the content headers and summaries have no noticeable pattern and many of the titles are abstruse (e.g., Hungry Donkeys) which according to the author is by design intended to handicap book reviewers, forcing them to read the book in its entirety. ^ "Prologue" (PDF). Fooledbyrandomness.com. Retrieved 3 November 2017. ^ N. N. Taleb; R Douady (2012). "Mathematical Definition, Mapping, and Detection of (Anti)Fragility". arXiv:1208.1189 [q-fin.RM]. ^ Naji, A., Ghodrat, M., Komaie-Moghaddam, H., & Podgornik, R. (2014). Asymmetric Coulomb fluids at randomly charged dielectric interfaces: Anti-fragility, overcharging and charge inversion. J. Chem. Phys. 141 174704. ^ Derbyshire, J., & Wright, G. (2014). Preparing for the future: Development of an ‘antifragile’ methodology that complements scenario planning by omitting causation. Technological Forecasting and Social Change, 82, 215–225. ^ Aven, T. (2014). The Concept of Antifragility and its Implications for the Practice of Risk Analysis. Risk Analysis. ^ Grube, M., Muggia, L., & Gostinčar, C. (2013). Niches and Adaptations of Polyextremotolerant Black Fungi. In Polyextremophiles (pp. 551–566). Springer Netherlands. ^ Antoine Danchin; Philippe M. Binder; Stanislas Noria (2011). "Antifragility and Tinkering in Biology (and in Business) Flexibility Provides an Efficient Epigenetic Way to Manage Risk". Genes. 2 (4): 998–1016. doi:10.3390/genes2040998. PMID 24710302. ^ Levin, J. S., Brodfuehrer, S. P., & Kroshl, W. M. (2014, March). Detecting antifragile decisions and models lessons from a conceptual analysis model of Service Life Extension of aging vehicles. In Systems Conference (SysCon), 2014 8th Annual IEEE (pp. 285–292). IEEE. ^ Isted, Richard (August 2014). "The Use of Anti-Fragility Heuristics in Transport Planning" (3). Adelaide, South Australia: Australian Institute of Traffic Planning and Management National Conference. Archived from the original on 2016-03-03. Retrieved 2015-01-16. ^ a b Jones, K. H. (2014). "Engineering Antifragile Systems: A Change In Design Philosophy". Procedia Computer Science. 32: 870–875. doi:10.1016/j.procs.2014.05.504. ^ Verhulsta, E (2014). "Applying Systems and Safety Engineering Principles for Antifragility". Procedia Computer Science. 32: 842–849. doi:10.1016/j.procs.2014.05.500. ^ Lichtman, M.; Vondal, M. T.; Clancy, T. C.; Reed, J. H. (2016-01-01). "Antifragile Communications". IEEE Systems Journal. PP (99): 1–12. Bibcode:2018ISysJ..12..659L. doi:10.1109/JSYST.2016.2517164. ISSN 1932-8184. ^ Atif Ansar; Bent Flyvbjerg; Alexander Budzier; Daniel Lunn (2016). "Big is Fragile: An Attempt at Theorizing Scale". The Oxford Handbook of Megaproject Management, Oxford University Press. SSRN 2741198. ^ Ramirez, C. A., & Itoh, M. (2014, September). An initial approach towards the implementation of human error identification services for antifragile systems. In SICE Annual Conference (SICE), 2014 Proceedings of the (pp. 2031–2036). IEEE. ^ Abid, A.; Khemakhem, M. T.; Marzouk, S.; Jemaa, M. B.; Monteil, T.; Drira, K. (2014). "Toward Antifragile Cloud Computing Infrastructures". Procedia Computer Science. 32: 850–855. doi:10.1016/j.procs.2014.05.501. ^ Monperrus, Martin (2017). "Principles of Antifragile Software". arXiv:1404.3056. doi:10.1145/3079368.3079412. ^ Guang, L.; Nigussie, E.; Plosila, J.; Tenhunen, H. (2014). "Positioning Antifragility for Clouds on Public Infrastructures". Procedia Computer Science. 32: 856–861. doi:10.1016/j.procs.2014.05.502. ^ Lichtman, Marc (2016-08-16). "Antifragile Communications". Virginia Tech. ^ Russo, Daniel; Ciancarini, Paolo (2016-01-01). "A Proposal for an Antifragile Software Manifesto". Procedia Computer Science. The 7th International Conference on Ambient Systems, Networks and Technologies (ANT 2016) / The 6th International Conference on Sustainable Energy Information Technology (SEIT-2016) / Affiliated Workshops. 83: 982–987. doi:10.1016/j.procs.2016.04.196. ^ a b c Nassim Nicholas Taleb (2012). Antifragile: Things That Gain from Disorder. Random House. p. 430. ISBN 9781400067824. ^ a b c d e f g Nassim Nicholas Taleb (2012). Antifragile: Things That Gain from Disorder. Random House. ^ Jim Paul; Brendan Moynihan (2013). What I Learned Losing a Million Dollars. Columbia University Press. ISBN 9780231535236. ^ "Gold Not 'Antifragile' Enough for 'Black Swan' Author". Finance.yahoo.com. Retrieved 3 November 2017. ^ Taleb, Nassim Nicholas (2 August 2010). "The Regulator Franchise, or the Alan Blinder Problem". Huffingtonpost.com. Retrieved 3 November 2017. ^ "Nassim Taleb's Cure for Fragility". Hbr.org. Retrieved 3 November 2017. ^ "Antifragility: How disorder makes us stronger". Fortune. Retrieved 3 November 2017. ^ Ed Smith. "Left Field From Michael Lewis to Montaigne, the best writers first live an interesting life" (PDF). Fooledbyrandomness.com. Retrieved 3 November 2017. ^ "Stress best". The Economist. Retrieved 3 November 2017. ^ Sizemore, Charles. "Nassim Taleb's 'Antifragile' Celebrates Randomness In People, Markets". Forbes. Retrieved 3 November 2017. ^ "Antifragile, By Nassim Nicholas Taleb". The Independent. 24 November 2012. Retrieved 3 November 2017. ^ "13-01-09". Skeptic.com. 9 January 2013. Retrieved 3 November 2017. ^ Taleb, Nassim N (2013). "Antifragility as a mathematical idea". Nature. 494 (7438): 430. Bibcode:2013Natur.494..430T. doi:10.1038/494430e. ^ Kakutani, Michiko (16 December 2012). "'Antifragile,' by Nassim Nicholas Taleb". New York Times. Retrieved 3 November 2017. ^ "Mathematics of Black Swans". Fooledbyrandomness.com. Retrieved 3 November 2017.